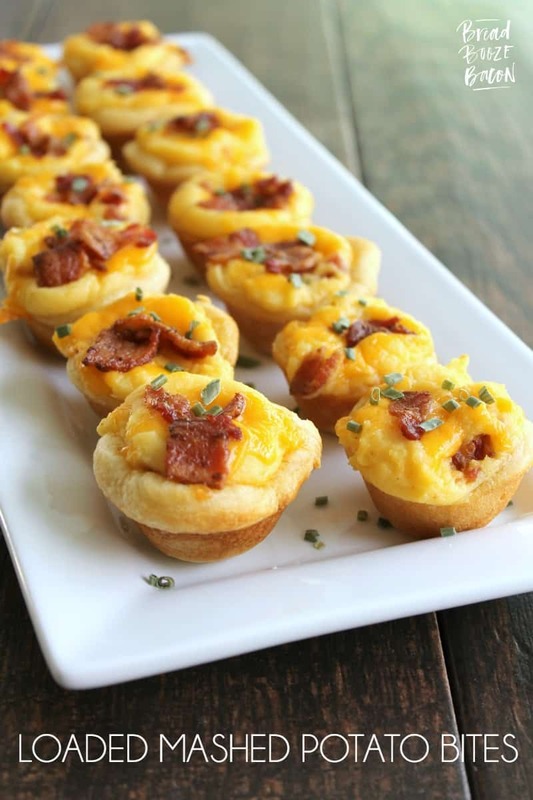 Loaded Mashed Potato Bites are an easy to make appetizer that turns your favorite side dish into a fun party bite! They will be the start of the party! Mashed potatoes are a must around our house! They’re our go to side dish. Confession time: I have a habit of buying the 10 pound bag of potatoes at the store and not getting to them quickly enough. Ergo yucky potatoes and me waiting to buy more potatoes until I know I’m going to cook them. But in the meantime, I’ll go to make something for dinner and no potatoes. Sad me. Sad Mike. So I’ve started a box or two of Betty Crocker Potatoes in the pantry for just such an occasion. I’m partial to the au gratin potatoes and the creamy butter or ultimate cheddar mashed potatoes. Since they’re made with 100% real potatoes, I know Mike will like ’em. One of our all time favorite side dish traditions is loaded mashed potatoes. Mike and I have been eating them together f.o.r.e.v.e.r. Ever since we met and started dating while at Texas Roadhouse. (Yes the place with the rolls and the butter.) 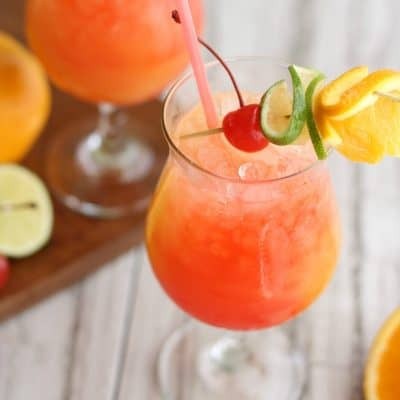 But since entertaining is currently the name of the game, I made our go to side into a fun party bite everyone will love! Because I mean really, what’s better than loaded potatoes in a crust with extra bacon and cheese on top?! We’d love to here about your traditions too! Leave us a blog comment or hit us up on social media (by tagging @breadboozebacon) with your family potato tradition stories – written stories, recipes, pictures, or videos we like them all – use be sure to tag them #ABettyTradition and #BettyPotates. In return we’ll be giving away a $50 Betty Crocker prize pack to one of you fantastic readers! *Giveaway ends December 10th. 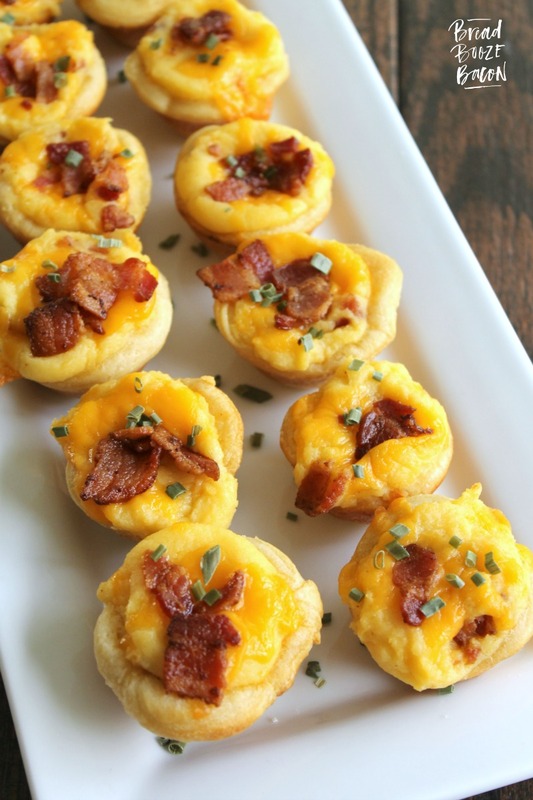 In the meantime, grab a coupon and start a new tradition with your family and these Loaded Mashed Potato Bites!! Preheat your oven to 350 degrees F. Lightly coat a mini muffin tin with non-stick cooking spray. Set aside. Prepare the Betty Crocker Ultimate Cheddar Mashed Potatoes according to package directions. Once finished transfer to a medium mixing bowl. Add in the sour cream, 1/4 cup cheddar cheese and half the bacon. Set aside. Unroll one pack of the crescent dough and lay it out flat on a cutting board. Using a 2-inch circular cookie cutter, cut out dough rounds. You need to get 12 rounds from each package of dough. 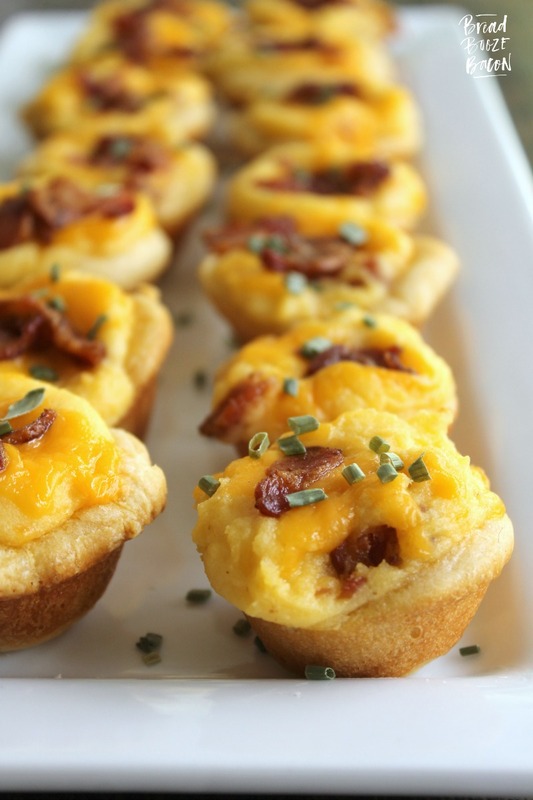 Place one dough round over each cup of your mini muffin tin. Repeat with the other dough package. 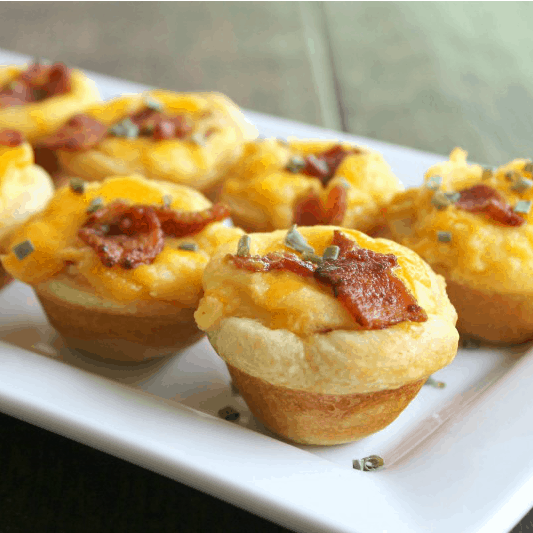 Using your finger tips, gently press the dough into the muffin tin cups, making sure there are no bubbles under the dough. 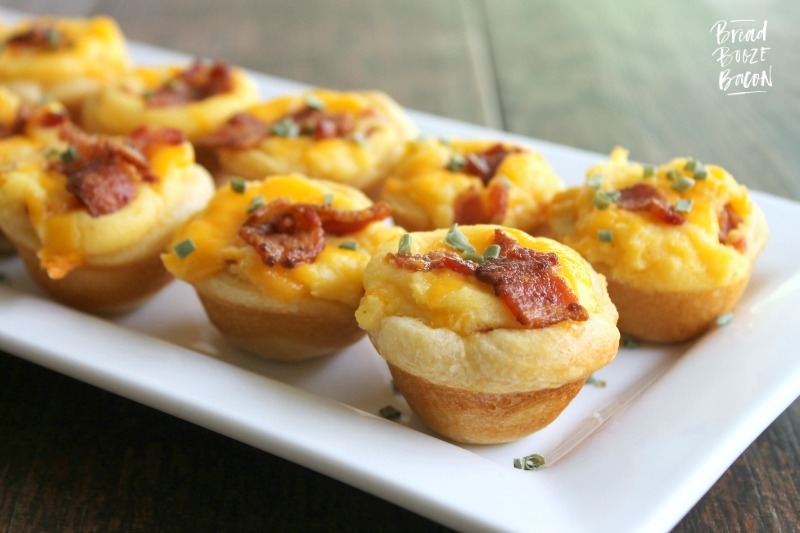 Use a small cookie scoop (or a 1 tablespoon measuring spoon) to portion the mashed potatoes into each muffin tin cup. Then, use your fingers to gently push the potatoes into the cups a bit more. Sprinkle the remaining cheese over the top of each bite, and then sprinkle the remaining bacon over top of the cheese. Bake for 12 minutes, or until the crescent dough is golden on the edges. Remove from the oven and let rest 2-5 minutes, or until cool enough to handle. Transfer the bites to a serving platter and garnish with chives, if desired. Serve warm or at room temperature. You can substitute 2 cups leftover mashed potatoes in this recipe too. Just make sure you smash down any big clumps so the potatoes fit into your cups nicely. If you're using Betty Crocker Creamy Butter Mashed Potatoes or homemade mashed potatoes, double the amount of shredded cheese in the potatoes. 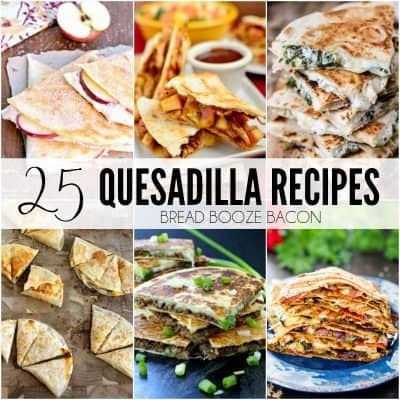 I can these be made ahead of time and baked the next day? For thanksgiving, we always make a side dish and play guess who dished it? #ABettyTradition We always make #BettyPotates as our midnight snacks- so good! For christmas, we do a fun christmas cookie exchange! We loved looking at these at Chipotle. I’m wondering how many cups of leftover mashed potatoes you would use for this recipe instead of the instant potatoes…??? Hi Jenny! 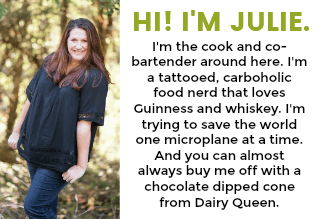 So sorry the recipe note didn’t show up properly! It’s 2 cups mashed potatoes.